When I toured FoodChain last year, I became completely enamored with what was happening in an old bread factory. In a space that just sat abandoned for years, close to a thousand fish and two thousand pounds of produce have been grown in a system with next to no waste. Beyond just the system, I believed in the mission of getting people excited about and reconnected with food through showing alternative ways to grow produce. I just knew I had to be a part of that. I couldn’t stop telling people about FoodChain after my first encounter and decided that my summer internship had to be here. I’ve learned a lot the past couple months. I went from barely knowing about aquaponics on a theoretical level to knowing the ins and outs and how to explain it to varying knowledge levels. Not knowing what was going on chemically in the water and how to balancing everything was challenging at first, but after making connections with what Leandra was saying, the readings she gave me, and what I have learned at Berea College I was able to understand and help maintain everything. I came up with ideas and was given the freedom and support to execute them. 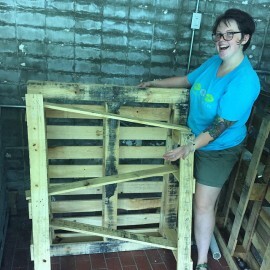 I learned about making the most of the resources available and was able to make two vermiculture bins and a gutter system using mostly out of stuff just laying around FoodChain or West Sixth Brewing. My time at FoodChain strengthened my passion for local sustainable food and agriculture, and has given me nudge I needed to make the most of my remaining time at Berea to learn as much as possible before getting into the real world. None of this could have been possible without such wonderful mentors through this whole internship. Becca, Leandra, and Reena are such a wonderfully supportive and hilarious team. I am so thankful to have been able to spend my summer working with such great people and making a tiny contribution to such a great organization. I would suggest interning at FoodChain to anyone ready to learn and laugh a lot and manage fish poop on a daily basis. You learn to love it.